New Galion High School assistant principal/athletic director Kyle Baughn has been extremely busy during his first few weeks on the job. He was tasked with hiring three new varsity head coaches the first week in his new role. There was no honeymoon period for Kyle Baughn after he was hired as the new assistant principal/athletic director at Galion High School. 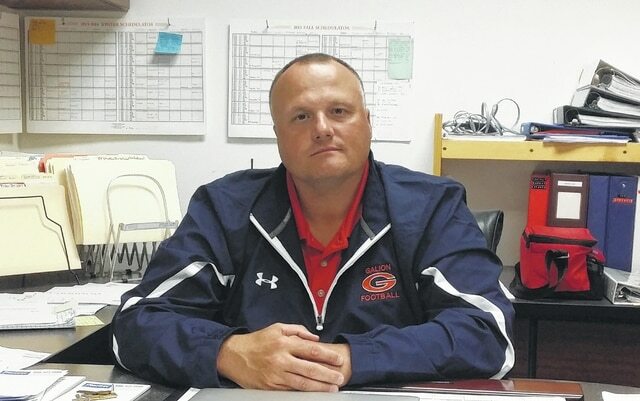 Baughn, who has worked for the Galion City School District since 1999, faced the task of filling three varsity head coach positions before he even picked up the keys to his new office in the high school. In fact, the Galion board of education voted to hire both Baughn and new boys varsity basketball coach Colby Bright during the same meeting on June 11. Also during that meeting, in light of the immediate need to find new coaches, Baughn was granted a supplemental administrative contract allowing him to serve as acting athletic director for the month of June (not to exceed 20 days). Baughn replaces Robert T. Putnam, whose resignation as high school assistant principal/athletic director was accepted by the board of education on April 16. Within a week of being officially hired, Baughn interviewed and recommended Nick Vukovich to serve as the new girls varsity basketball coach at Galion. Vukovich received approval from the board of education on June 16. The new AD said he has confidence in the abilities of Bright and Vukovich to lead the basketball programs. Bright is a 2002 alumnus of Galion. He returns to his alma mater after one year as head coach at Crestline High School. The Bulldogs finished 4-19 overall and 3-15 in the Northern 10 Athletic Conference during the 2014-15 campaign. Bright also coaches track and field at Galion. Vukovich comes to Galion after two seasons as head coach at Ridgemont High School in Hardin County. He took over a Lady Gophers program in 2013 that was 0-23 the year before he arrived. Ridgemont finished 5-18 in his first season and 3-20 in 2014-15. He is a 1999 alumnus of Cardington-Lincoln High School. Baughn said he will spend this week trying to find a new varsity softball coach. The application period ended June 19 and interviews are being conducted this week. “I’m hoping if not (June 26), the following Monday (June 29) we’ll have an announcement,” Baughn said. Baughn’s move to the assistant principal/AD role leaves a vacancy in the football coaching staff. He served as freshman football coach. Also, he said, the varsity program is in need of a line coach. Baughn taught mathematics at Galion Middle School prior to accepting his role as an administrator at the high school. He previously served as an assistant principal at the middle school. During his time at Galion, he has also coached wrestling.